Our Warehouse is located in UK! Wheel Size: 26 Spokes: Steel, 12G×2.6mm. Max load capacity: 100kg (36V250WR36V250WF). Max load capacity: 200kg (48V1000WR48V1000WF48V1000WRC). Tire: Nylon Rim: Alloy double wall. Key feature: Built to the highest international standards Nylon tire& alloy rim& stainless steel spoke Aluminum alloy powerful controller guarantee big current supply Twist throttle has battery level and power-cut off LCD display shows battery level and pedal assistance settings (only for 48V1000RC) Brake Levers cut off the power supply to the motor safely 8 point Crank speed sensor for pedal assist Aluminum alloy powerful controller. Upgraded Intelligent Motor Controller:For 48V1000WR48V1000WF48V1000WRC. Allow you to swap two power modes between the full 1000W power or 250W power by a single blue switch wire is embedded in controller. Still remain the full 1000W power with no speed control. (Only for Pedal Assist System, "PAS"). The 250W system requires a 36 Volt electrokinetic cell battery with a nominal capacity not less than 8.8Ah. The 1000W system requires a 48 Volt electrokinetic cell battery with a nominal capacity not less than 11.6Ah. Battery and charger are not included in package. The UK regulations dictate that a kit must not exceed the rated power of 250W to be road-legal. Caution: For your Safety, Please turn off the battery before connecting the Controller. Inspired by the French word " Voila " (Look, Bravo), stands for pursuing the comfortable and elegant French romantic life. Brand registered in Germany, adhering to the German rigor, using first-class process, combined with sophisticated technology. Our logo combines " V " and " M " , exactly meaning Voilamart. Our warehouse is located in UK! Voilamartcomau is one of UK's fastest growing online retailers, which was founded in 2005 and target worldwide market. With our best effort, we are now trusted by more than 100,000 customers nationwide. We are dedicated to offering you an unrivalled choice of products with unbeatable low price and best quality. Directly sourcing from the manufacturers, you will be able to save up to 80% off retail price. Our massive warehouse of 4,000 sq metres located in Leicestershire, buyers can get your items real quick. Special circumstances will be listed clearly in the listing. Designated trademarks and brands are the property of their respective owners. 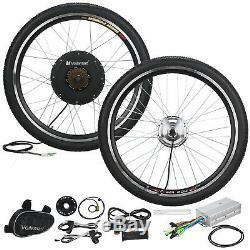 The item "Voilamart 26 Electric Bicycle E Bike Conversion Kit 250W 1000W Front Rear Wheel" is in sale since Wednesday, July 26, 2017. This item is in the category "Sporting Goods\Cycling\Bike Components & Parts\Electric Bike Components". The seller is "voilamartcomau" and is located in Leicestershire. This item can be shipped to United Kingdom. Note: Battery and Charger is not included in package.